After years of great expectations, telehealth is starting to live up to its potential. Healthcare providers are turning to this form of electronic communication to assist them with patient care, while individuals are excited about the convenience, access, and lower cost of the visits. This growth has been driven by faster internet connections, ubiquitous smartphones, and improved insurance reimbursement. In addition to ease and access to care, telehealth allows health systems and hospitals to keep pace with advancing technology and serve the social media generation. While telemedicine capabilities are some of the most exciting opportunities existing in healthcare today, inconsistent reimbursement standards continue to hinder successful program adoption. 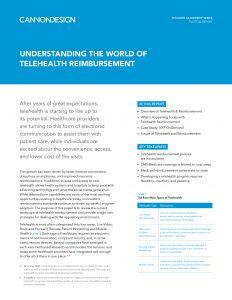 This Tactical Report reviews the current landscape of telehealth reimbursement, provides insight into strategies for dealing with the regulatory environment, and discusses the future of telehealth.